Whole grains lightened up with raw or lightly cooked vegetables and chopped herbs make a great centerpiece to summer meals. In the past couple of weeks, I’ve made two, with very different results. 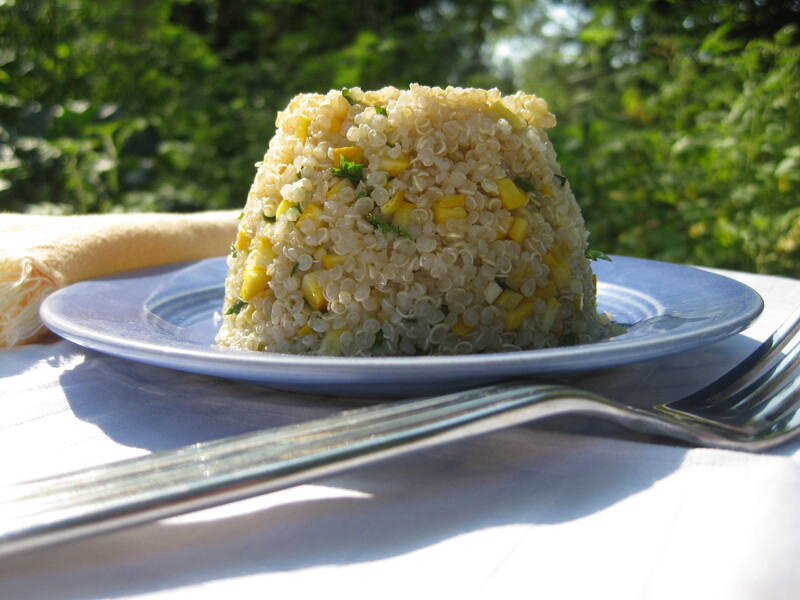 The first was quinoa tossed with tiny cubes of raw yellow zucchini (you could lightly steam it instead). It was dressed with lemon juice and olive oil and tiny flecks of lemon peel, parsley and mint. I added the lemon juice and a pinch of salt to the quinoa while it was warm, tossing in the rest of the ingredients right before serving at room temperature. As I found out from the leftovers, this can be made hours or even a day ahead, which is great for summer schedules. Simple and flavorful with just the right amount of tang and crunch. The second one was inspired by Martha Rose Shulman’s New York Times column called “Recipes for Health.” I read the New York Times online every day and find that some of the best cooking ideas are not in “Dining and Wine,” as you might guess, or even in the Magazine. They’re in sections like “Health” (where Shulman writes) or in City Room, where urban forager Ava Chin mines the parks and sidewalks for edible weeds. 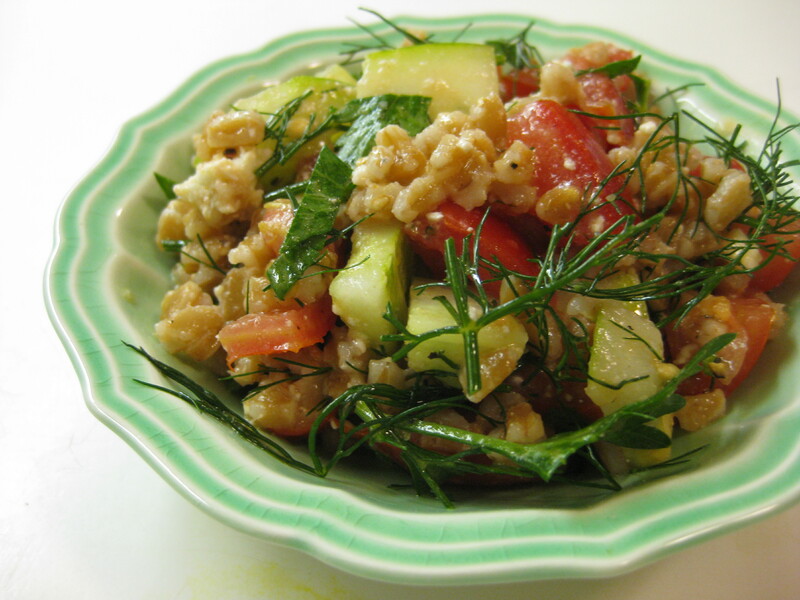 This salad combines cooked farro with tomatoes, cucumbers, parsley, dill and basil. Dressed with a touch of olive oil and red or white wine vinegar and garnished with tiny black olives and a little feta cheese, this was like a Greek salad with grains. This salad benefited from marinating for half an hour or longer. Again, simple and delicious.